Former Starbucks chief executive Howard Schultz has angered Democrats by considering an independent campaign for president in 2020. They are condemning the billionaire’s idea as a “vanity project” that would only help President Donald Trump. Political strategists say such a third-party candidacy would divide the left, taking votes from the president’s yet-to-be nominated Democratic challenger. Neera Tanden, president of the liberal think tank Center for American Progress and confidante of 2016 Democratic candidate Hillary Clinton, tweeted: “Vanity projects that help destroy democracy are disgusting. Michael Bloomberg, another billionaire who previously considered an independent bid, released a statement criticising Mr Schultz’s decision without specifically naming him. He said: “The great likelihood is that an independent run would just split the anti-Trump vote and end up re-electing the President. Larry Sabato, who directs the University of Virginia’s Center for Politics, tweeted that Mr Schultz’s slogan “might as well be, ‘Re-elect Trump'”. The Republican president himself appeared to goad Mr Schultz into launching a bid, saying the businessman “doesn’t have the ‘guts’ to run”. Democrats in the Pacific state posted a photograph, without comment, of a Starbucks cup with: “Don’t do it Howard” written on. Democrats are gnashing their teeth. Donald Trump is essentially daring him to run. 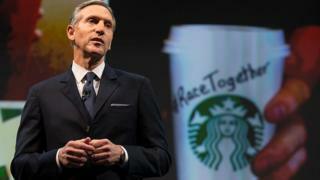 That should tell you all you need to know about the perceived political implications of an independent presidential bid by Starbucks ex-CEO Howard Schultz. Of course, things don’t always work out the way they first seem. Republicans panicked in 2000 over Pat Buchanan’s conservative third-party bid damaging George W Bush, but it had no significant impact. Both Democrats and Republicans still believe Ross Perot’s independent run in 1992 hurt their candidate. A self-proclaimed “centrist” running on a deficit-reduction platform might end up syphoning as many Republican moderates away from Trump as liberals or independents away from the Democratic nominee. Or, given today’s polarised political climate, not syphoning much of anything away from anyone. The reality, however, is that Democrats feel pretty good about their position right now. Mr Trump has had a rough couple of weeks, and his poll numbers are down. They view anything that could shake up the current dynamic – even if it is more than a year and a half from election day – as an unwelcome development. In a weekend interview with Axios the former global coffee chain boss said he was aware his bid was “going to create hate, anger, disenfranchisement from friends, from Democrats”. But he maintained he would be doing the right thing by running as a “centrist independent”. In an interview with the New York Times, Mr Schultz said it would be “disingenuous” to run as a Democrat. He cited his disagreements with the party over free college tuition, universal healthcare, and other positions that he said have “shifted so far to the left”. Many Democrats still blame Ralph Nader’s 2000 independent presidential bid for helping Republican George W Bush beat Democrat Al Gore. In 2016, Green Party candidate Jill Stein and Libertarian Gary Johnson won hundreds of thousands of votes in states that were won by Mr Trump. A former espresso machine salesman, he grew up in public housing in Brooklyn, New York. He started working for the original Seattle Starbucks chain back in 1982 when it only had 11 outlets selling coffee beans. He acquired the company in 1987 and by the time he stepped down in 2018, it had grown to 28,000 cafes in 77 countries around the world. The 65-year-old frequently used his position to speak out on social issues like immigration and gun control. He now has an estimated fortune of about $3bn (£2.3bn) and is a regular donor to Democratic campaigns, including that of Barack Obama and Hillary Clinton.